Crepes St. Jacques is a copy cat recipe from the old Magic Pan restaurant chain and the flavor of this is outstanding. I knew it wouldn’t take long for me to try a savory crepe dish. After having so much fun making sweet crepes, I had to go for savory. And Christine had told me how good this meal could be. (See Fresh Fruit Filled Crepes). 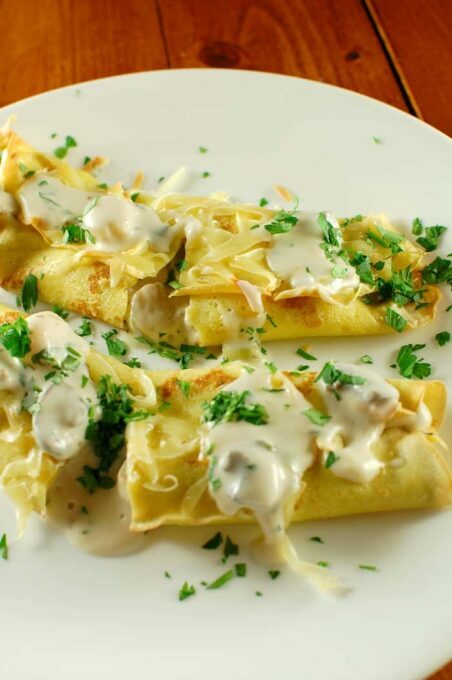 This is Crepes St. Jacques, which is a crepe filled with scallops cooked in a mushroom bechamel sauce, then accented with cheese. 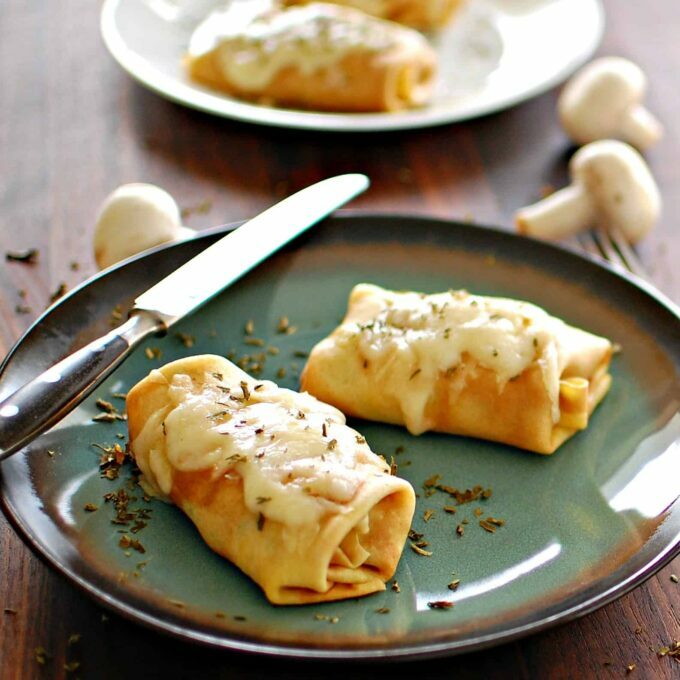 I looked up Coquilles St. Jacques crepes on google and immediately found a copycat recipe for a dish that The Magic Pan restaurant chain used in the 70’s. It was from Uncle Phaedrus at www.hungrybrowser.com. 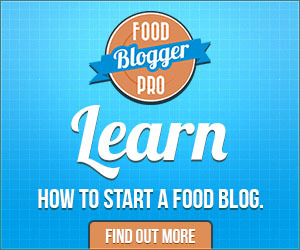 I then looked at another website that had the identical recipe and the wording was nearly identical. That was from www.absolutelyfresh.com, which is a fish market/restaurant in Omaha Nebraska. So that is the recipe I tried and it is really spot on. The taste is complex with lots of scallop flavor and everything about it works. 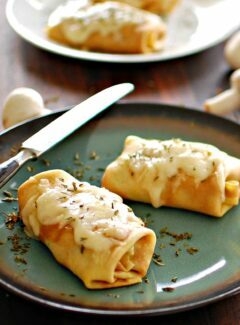 When I make this again,(soon), I will make some additional mushroom sauce to pour over the finished crepes. 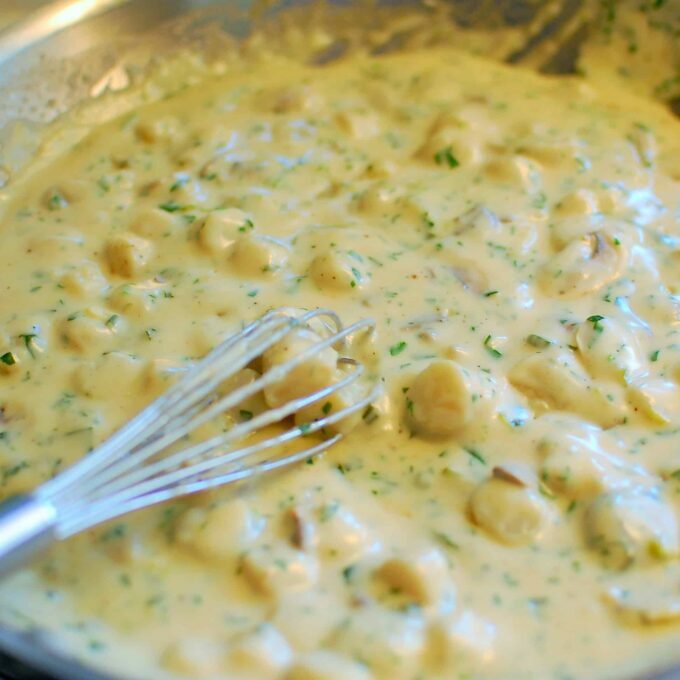 Additionally, other recipes add grated cheese to the bechamel sauce, but I think that would make the dish too filling. It has enough going on and is flavorful enough without the extra cheese. Here’s a look at the creamy, scallop filling. 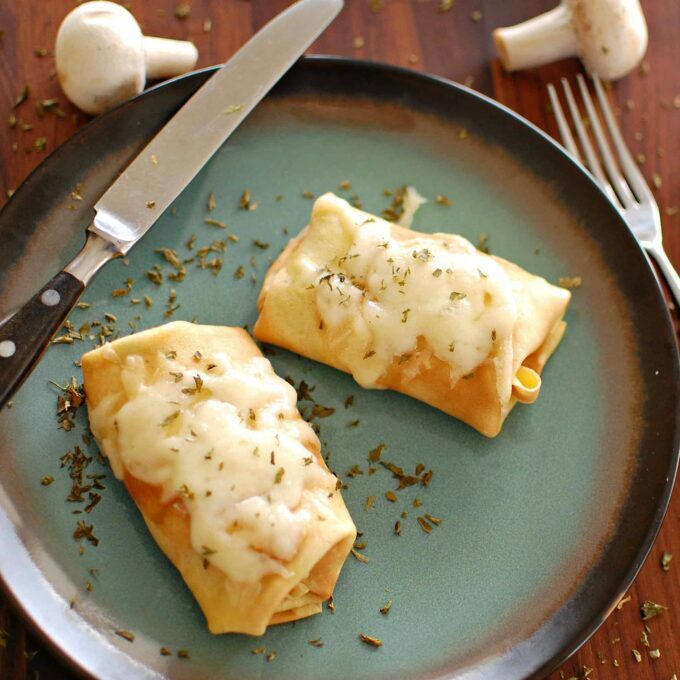 Wrapped, scallop filled crepes. Another presentation method would be to just wrap the sauce in crepes that were trimmed for consistency and not have the sides tucked. Combine all the ingredients except the flour in a bowl and whisk together. Gradually add sifted flour and whisk until a smooth batter is achieved. Ladle 1/4 cup of the batter at a time into a small fry pan or crepe pan that has been preheated to medium high. Swirl the pan quickly after you pour the batter, so the pan is coated with a very thin layer of batter. Cook the crepe for about 45 to 60 seconds, until the edges start to curl up. Flip and cook an additional 20 seconds. Place on a plate between layers of wax paper until needed. Combine the white wine, green onion, mushrooms and scallops in a saucepan. Simmer for 5 minutes on medium. While the scallop mixture simmers, melt the butter on medium heat in a large skillet, and stir in the flour and salt. Whisk continually until the flour becomes a light brown color. Pour in the cream and cook, whisk constantly until thick, which takes about two minutes. Add the parsley, and then the scallop mixture. Line a sheet pan with parchment and spray with cooking spray. Fill each crêpe with 3 to 4 T of the scallop mixture. Fold the crêpe and lay it seam side down on the parchment, then sprinkle with the cheese. 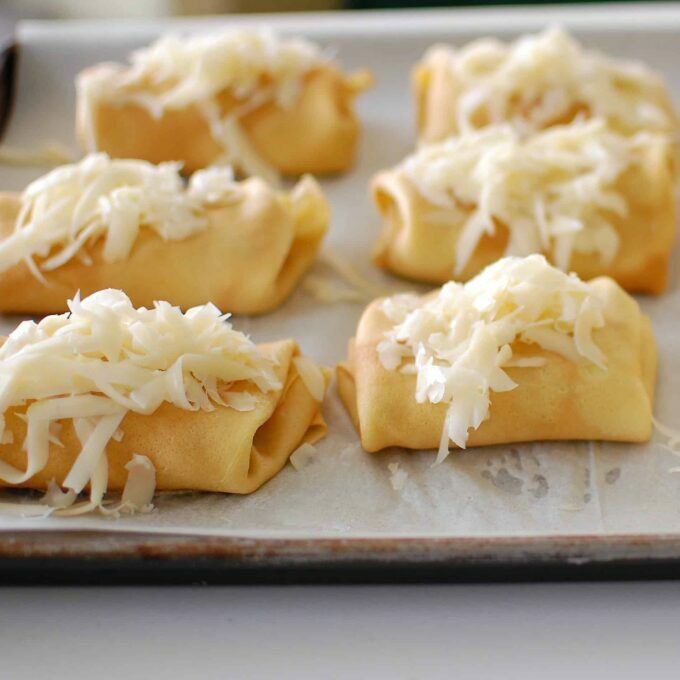 Place in a preheated 350F oven until the cheese melts, about 10 or 12 minutes. Definitely worth a try. This could be an elegant meal that is assembled in an hour or less. It certainly tastes great. 5 stars for sure. This is excellent. Making it again for a friend’s birthday. Don’t even hesitate if you love scallops. I can’t say enough good things about this recipe. Thank you for posting it. Thanks Mark. It is very tasty. I have made these for years. I found my recipe in a crepe cookbook I bought it the 70s. 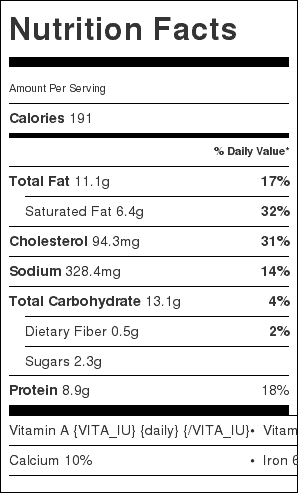 The only other thing I add is about 12 ounces of raw medium shrimp. Adds another dimension to this dish. Thanks for the tip Karen, I’ll have to try it with extra shrimp. I also add shrimp and a touch of dry sherry instead of white wine. I use to always get these at the Magic Pan in Beverly Hills along with an Orange Almond Salad on the side. so good . Fantastic! I made it without mushrooms (hubby is sensitive to them), still so good! Thank you! Thanks Valerie. Just the flavor of the scallops in the white sauce is enough. I made these for my husband’s birthday tonight. Just delicious! Thanks for sharing!! Thanks for the comment. Happy birthday to your husband, and I’m glad you liked the Crepes St. Jacques. These are surreal. Absolutely spot on identical flavours of the Crepes St. Jacques served at the former Garden Creperie in Winnipeg, Manitoba. Divine silky sauce swimming with eclectic flavours surrounded by the pillowy tender flavourful crepes. We topped each crepe with some sauce before sprinkling with Gouda cheese. Served with a baby kale and beet salad with a shallot dressing, we were in heaven! I fix this dish when I want something really good tasting. Happy to hear you liked it. When Joe made this I thought I died and went to heaven, it is so amazing. I love crepes, I love mushrooms, and I love scallops but I never would have thought of putting them together, much less would I have believed that the combination would taste so divine.